Hi Mel, This was a great shoot out thanks to your rifle site. Here are the pictures from Michael McDonald Pro Staff Shooter Libsaver July3 4th. 80 targets tied for first place and we had a one shot shoot out. We were allowed one shot each at the Javelina pig and I won. Thanks to your rifle site I had the winning shot. Will the Peep Eliminator® work with a single adjustable front pin sight? Can I use more then one pin? Yes, you can use as many pins as you wish. You will shoot greater distances with fewer pins and your settings will be much closer then your peep sight settings. Do I need the light assembly? For anyone hunting from an enclosed blind I recommend the light. Early in the morning and late in the evening when the big boys like to move, it's legal shooting hours but it's dark inside the blind. The purple rheostat light will only make the alignment dots glow, it will not light up your hand where your griping the bow or the inside of the blind. I have never used the light assembly but I never hunted from an enclosed blind. If I can see my target I can shoot it with consistent accuracy. However in early fall, in heavy vegetation, on a gloomy or rainy day, the purple light might just give you the extra edge you need to make the perfect shot. It's your call. Can I shoot the Peep Eliminator® by maintaining anchor? Yes, To shoot by maintaining anchor, you set your bow up to where your bottom pin is always sitting between the alignment dots every time you come to your anchor point. You will see all your pins at one time but your bottom pin will always be sitting between the alignment dots. Once sighted in, move your bow up or down to place the pin for the distance your are shooting on your target. You will always see your bottom pin sitting between the alignment dots when placing the proper pin on target. Will the Peep Eliminator® work with a Hoyt Carbon Element bow? Yes, the Peep eliminator® will work well with any compound bow except the Liberty I bow. 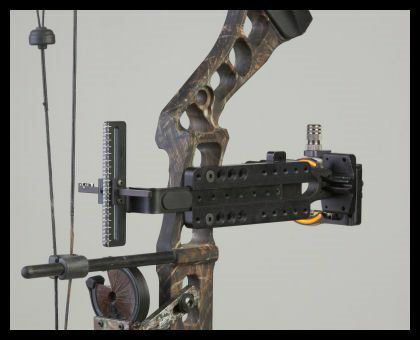 Some compound bows, where the bow cables are very close to the riser, it will require the shorter mounting bracket which I have in stock, or if the round tube shaft for your bow cables to slide hits the Peep Eliminator® T bracket, I have an offset T bracket to correct this. The Peep Eliminator® will also work with any recurve or long bow drilled and tapped for a front sight. Does the V block cover up to much of your target? No, The military and the common hunter have shot open rifle sights for decades, shooting 250 yards or more with consistent accuracy. On a rifle, the V notch is sitting on top of the barrel and chamber. If that was a problem the military would have never used this method for aiming. It's a mental thing for some archers. Almost every hunter shot a BB gun with open rifle sights when they were young and didn't think anything of it. When I was in the service the saying was, aim small, miss small, aim big, miss big. Our instructor said, if he wanted to shoot someone between the eyes, he doesn't need to see their nose. What side of the string should I aim? Most archers keep their head erect and aim on the outside of the string. If you tilt your head to the string you most likely will aim on the inside of the string. When using the Peep Eliminator® it makes no difference. Its what feels most comfortable for you and every time you come to your anchor point you have clear vision of the V notch and your pin is sitting between the alignment dots without moving your head or bow arm. Can I shoot with both eyes open? Yes, that is the best way to shoot a weapon if you're aiming with your dominant eye. Your peripheral vision is much greater and you will catch a glimpse of movement if something is coming in from the side. It may be bigger then the one you were focusing on. Why is your sight more accurate then the Peep Sight? The peep sight has margin for error, bow torque, peep twist, low light shooting conditions, head placement, degree of angle, etc. You don't have time to think about all those things you need to when hunting. Bow torque and head placement are two important factors to shoot archery with consistent accuracy. Time is of the essence when hunting. The Peep Eliminator® functions like shooting a rifle, nothing to think about but the proper pin sitting between the alignment dots, on target, meat in the freezer. There are no low light shooting conditions with the Peep Eliminator® without the optional light assembly when hunting from a tree stand. The top of the bow rocks rearward accomplishing the same as moving your bow arm up or down the pins will keep popping up dead center of the alignment dots. You will not see all your pins at the same time. You don't need an anchor point to shoot the Peep Eliminator® with consistent accuracy, allowing you to shoot bending around a tree to shoot behind you or bending under a limb. When you have the adrenalin flowing, as soon as the pin hits the vitals you release the arrow. It may have only been a 15 or 20 yards shot, you hit the animal in the shoulders or the stomach. You had the pin where it belonged but you were torquing the bow or had your head in the wrong position, or both. You didn't know that until you made the bad shot. Too late. There is no margin for error for aiming using the Peep Eliminator®. The Peep Eliminator® will obscure the front pin if you torque the bow or have your head in the wrong position as when you sighted in your bow, making you correct your mistake before you shoot. You will correct your mistake in seconds and make an accurate shot. I know of no other rear alignment sight that will do this for the archer. Do I need a kisser button? No, The Peep Eliminator® is much more accurate than the kisser button. If you let the kisser on your bow and draw your bow several times with your eyes closed, when you open your shooting eye the front pin will be high or low of your alignment dots causing you to shoot high or low. It feels like it is in the right place, but it's floating up or down in the corner of your mouth. Removing the kisser button and the peep will make your bow shoot faster and quieter. Why is maintaining form more accurate then maintaining anchor? When you move your bow up and down, the chances of torquing the bow or having your head in the wrong position as when you sighted in your bow is much greater then when you shoot by maintaining form. When maintaining form you don't move your head or bow arm, simply slide your release slightly down your cheek. The appropriate pin for the distance you are shooting is the only pin you will see sitting between the alignment dots. Before the peep sight and the release were invented everyone shot with fingers. Many archers shot using the method called walking the string. The archer would have different color markings on the string to know where to grab the string for the distance they were shooting. Since the release attaches to the string or D loop you slightly slide your release down your cheek. The top of your bow rock back raising your sight pins, achieving what you do by moving your bow up and down. There are sanction tournaments today that will not let your compete if you shoot by walking the string. Mr. Randy Ulmer who is in The Archery Hall Of Fame wrote an article years ago called Shooting Guide. In this article he has a paragraph Shooting Tips. He states that your your anchor point will move slightly as you change from on sight pin to another. Your anchor point will be higher on your face when aiming with your 20 yard pin then when using your 50 yard pin. Who would you believe? The man who is in The Archery Of fame or someone that says you cannot move your anchor point? Mr. Ulmer also talks about the peep sight because it was the only rear form maintainer on the market at that time. Using the peep sight was much better then not using any rear form maintainer at all. Mr. Ulmer's article is posted on my website www.peepeliminator.com. The Peep sight has too many margins for error, Peep sight twist, bow torque, WRONG head placement, low-light shootings conditions, Need to look at the level, Need to know the degree of angle, Cannot shoot with consistent accuracy from any angle or position, etc. No margin for aiming error, you either see your front pin or you don't. Telling you you're out of proper aiming form, Making you correct your mistake before you shoot making and accurate shot. No peep sight twist, No worries about how torque, No worries about WRONG head placement. No need to look at your level, No need to know the degree of angle, Shoot with consistent accuracy from any angle or position. 30 day money back guarantee excluding shipping. SHOOT EARLIER, SHOOT LATER, SHOOT QUICKER, SHOOT BETTER, with rifle-like accuracy.